The Republic of France extends from the English Channel (St. Brieux) and North Sea (Calais) to the Mediterranean (Marseilles); from the Rhine (near Besançon) to the Atlantic Ocean (Bordeaux). ‘France’ also includes overseas areas such as French Guiana and Guadeloupe. The country is formed by 18 regions, some 643,801 square kilometres. These regions (like Bourgogne-Franche-Comté and Brittany) are broken down into 102 départements and then further to communes, which in 2013, numbered 36,681 (Paris, the country’s capital city, is a commune as well as a département). In 2017, the population of France and its overseas regions was almost 67 million. This map details the 86 départements that made up France in 1816, the year after Napoleon Bonaparte was defeated at Waterloo. Each département was usually named after a physical feature such as a river or mountain. P.A.F. 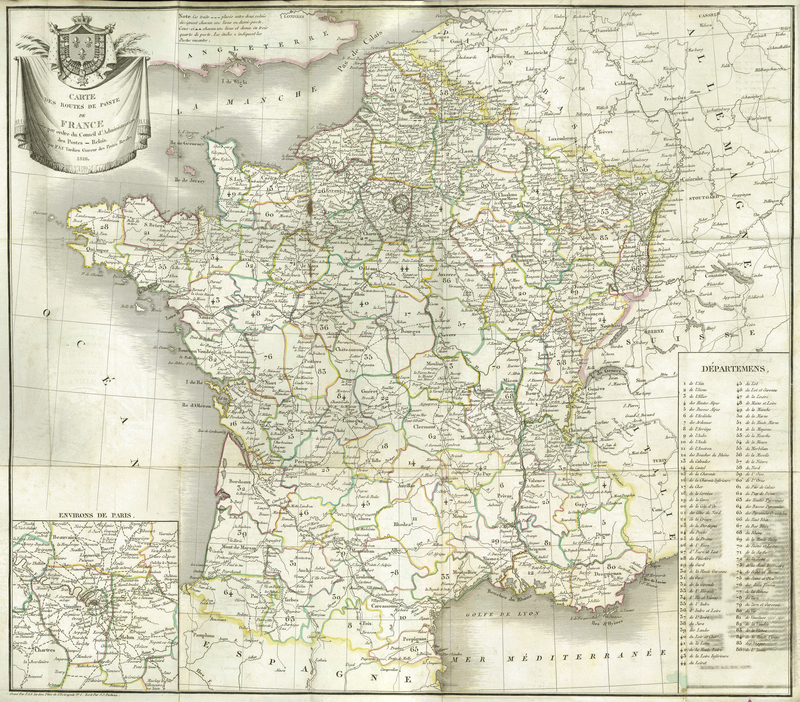 Tardieu, a member of a family of famous French engravers, produced the map. ___, “État Général des Postes du Royaume de France,” ourheritage.ac.nz | OUR Heritage, accessed April 26, 2019, http://ourheritage.ac.nz/items/show/10568.